Donna Urquhart & Cameron Pilley, an Aussie pairing that has only been together for eight months, claimed Commonwealth Games Squash gold after winning the Mixed Doubles final in straight games in front of a capacity and partisan crowd at Oxenford Studios in Gold Coast – thus keeping the event’s gold medal in Australian hands for the fourth time since 2006. The fourth seeds made their breakthrough in the semi-finals when they despatched second-seeded English pair Alison Waters & Daryl Selby. 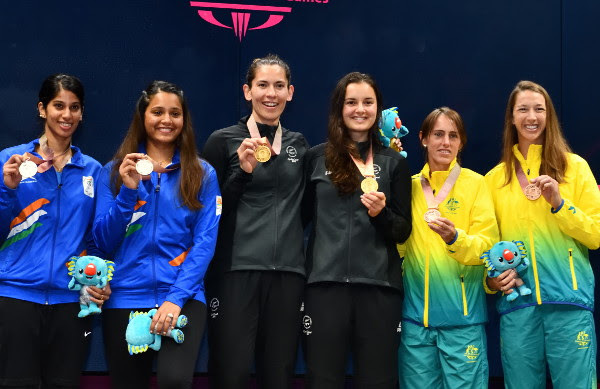 Their opponents in the final also pulled off a semi-final upset – Dipika Pallikal Karthik & Saurav Ghosal, an Indian pairing celebrating their second successive partnership in the Commonwealth Games, surviving a dramatic third game tie-break against the event favourites. 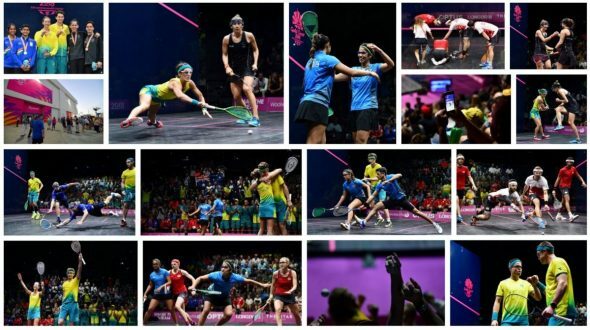 But, buoyed by the crowd, Urquhart & Pilley – first cousins who hail from Yamba in New South Wales – defeated the Indians 11-8, 11-10 in 31 minutes to claim the first squash medal for the hosts on Gold Coast.